Many years ago when my daughters were small, I made t-shirts for them. My friend Wendy taught me how to sew on the neck ribbing. During that time my mom asked me to make a bib for dad. He came home everyday for lunch, and she didn't want him to spill on his dress clothes. At that time, I took a towel, cut a hole in it and used the tshirt neck rib technique. He used it for years. Now thirty five or more years later, dad asked me to make him another bib. He usually tucks a dish towel in his shirt when he eats to protect his clothes. He figures it saves me when I do the laundry. I dug out an old hand towel and a piece of ribbing I had stashed. I didn't realize how bad the wrinkles look in the pictures, but here they are anyway. Here is Dad sporting his new bib. Lay a hand towel flat and draw a circle on the fabric. Cut a circle about 3 or 4 inches down from the top and centered. I used a cereal bowl which was about 6.25 inches in diameter. That fits over an adult head just fine. I traced around the bowl and cut out the circle. Then you figure the circumference of the circle you made by doing simple math. In this case the diameter or the distance across the circle is 6.25 inches. The formula for circumference (distance around the circle) is 3.14 (pi) x diameter. So 3.14 times 6.25 equals 19.63. I use this number to figure the length of the ribbing. The length of the ribbing needs to be 15% less than the circumference. This would make the ribbing about 16.69 inches. I made it 16.75 inches to allow for a seam. It sounds more complicated than it actually is. This bib can be made for kids using the same technique. I have used the smaller tea towel with a smaller hole for a child's bib. I cut a piece of ribbing 2.5 inches by 16.75 inches. I then sewed a seam on the short side to form a circle. Fold the width in half and divide into quarters. Put in pins to mark it. Put a pin at the ends and in the middle. Then divide the hole in the towel into quarters and mark that with pins. Next put right sides together and line up the pins and pin the ribbing band to the opening. Begin sewing around, stretching the rib to fit. Turn to the right side and you're finished. 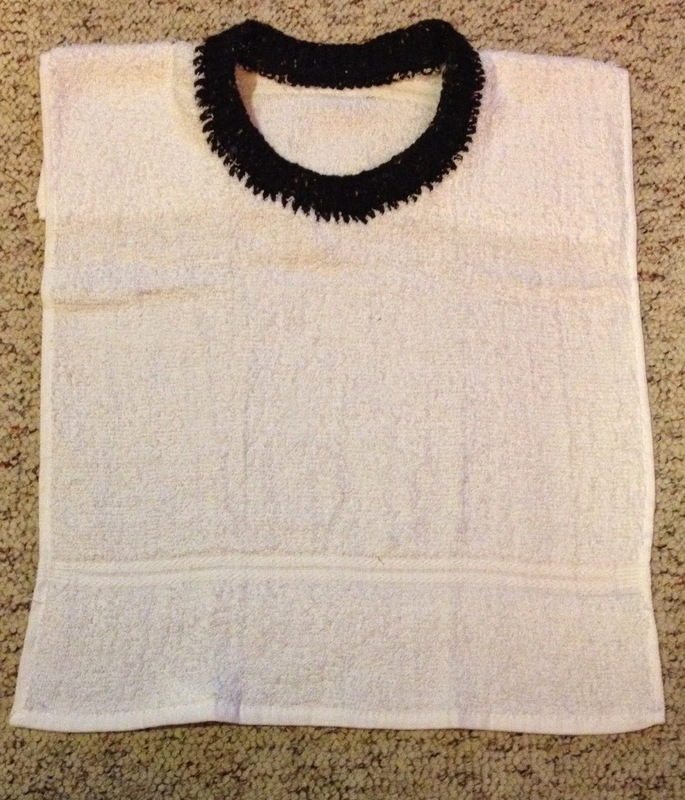 After I made this sewn version, I decided to knit a ribbed band around the neck hole. I just cut the hole the same as above. Then I crocheted around the raw edge. In my case it was 88 stitches. When I got all around, I changed to a size 6 circular knitting needle, picked up a stitch in each crochet stitch and knit a ribbing for an inch or so. Then I bound off. For a quick bib, it worked out great.